Spring is birthday season in our household– all three of my boys were born in March or April, almost exactly 24 months apart. That means that the spring is a busy time as we celebrate with parties, special dinners, and special school celebrations. 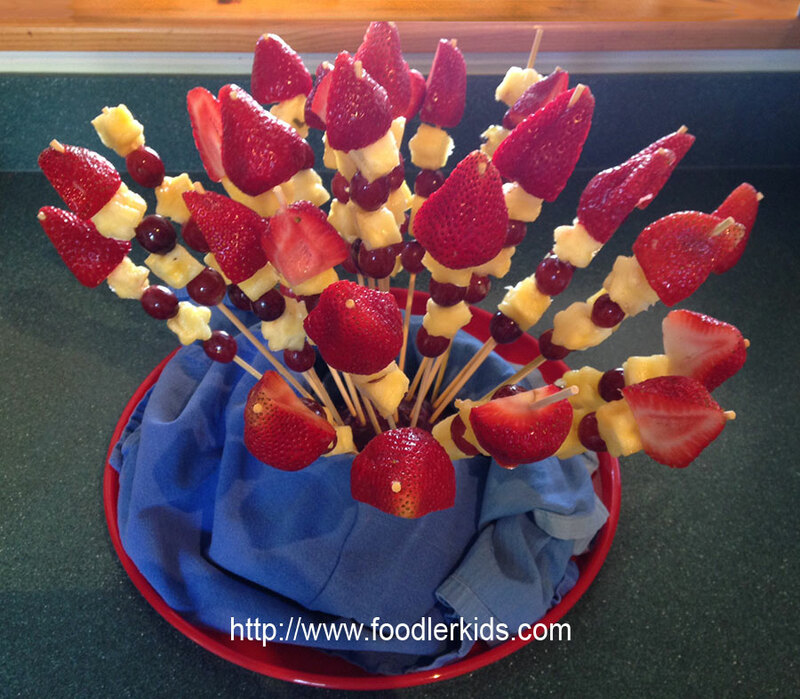 For school celebrations, especially, I want to bring something healthy but fun for the kids. 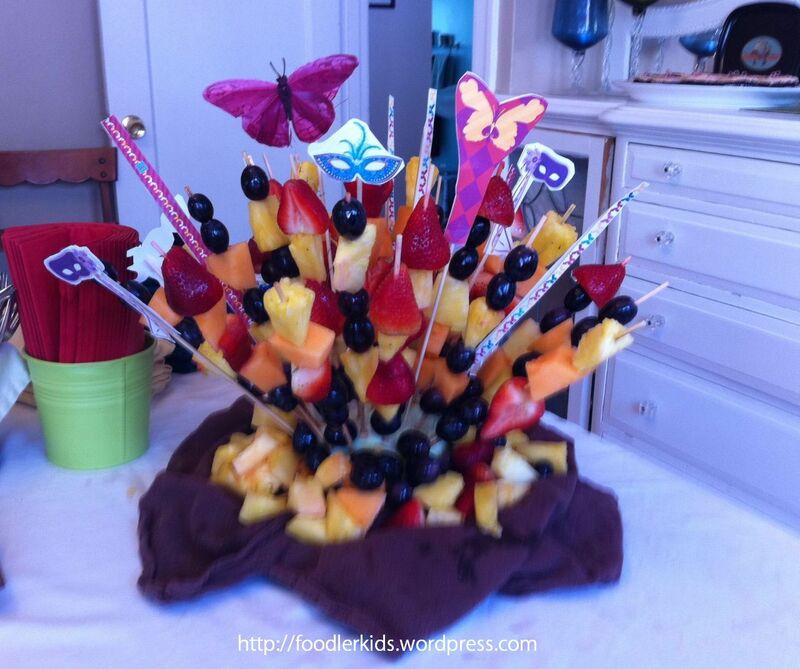 The fruit skewer, in many different variations, has been in heavy rotation this school year. For Pepper’s 4th birthday, I made this homemade edible arrangement. After he did his school’s traditional walk around the sun four times, he helped me pass a fruit kebab to each of his school friends to enjoy. This fruit arrangement was very simple to make. First, I sliced the pineapple, about 1/4″ thick. I didn’t even bother pealing the fruit, which can be time-consuming. My husband used the leftovers in his morning green vegetable juice for sweetness. Next to give the kebabs a bit of extra flare, I used a small cookie cutter (fondant cutter, technically) to cut out shapes stars. 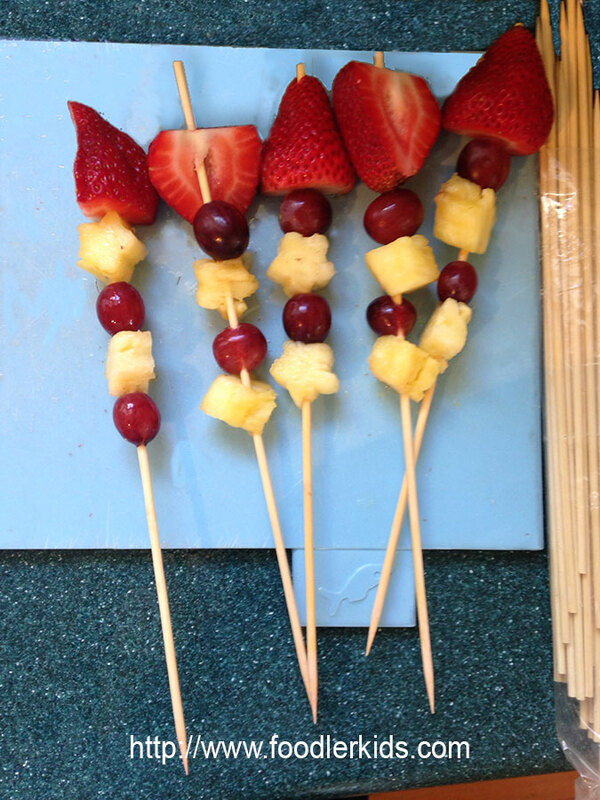 Then, I placed the pineapple, along with strawberries and grapes, on bamboo skewers. You’ll see I halved the strawberries. I only did this because they were somewhat large and I wanted to have the same fruit on the skewers for each child — an important detail for this age set. Finally, I halved a cabbage. I placed the cabbage, cut side down on a plate and positioned the skewers to make a full-looking design. To finish off, I covered the cabbage with a napkin, just for aesthetics. Here’s an alternate arrangement I did for a baby shower. I spent a little more time polishing off the finished product for this special occasion. I added extra loose cut fruit at the base. To go along with the baby shower’s the Mardi Gras theme, I added some decorative skewers with images I found online. While I was being helped, I let my sons play on the iPad games that are conveniently set up at a low table for kids. Before I knew it, my 5 year old was addicted. 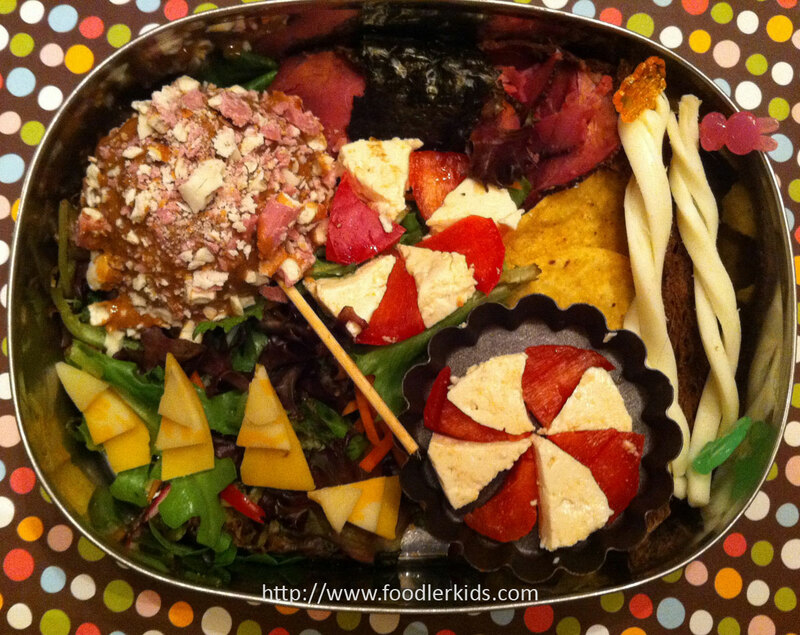 Candy crush is a great theme for a bento lunch, because you can use all sorts of foods with wonderful colors. For my bento, I constructed a cardboard grid to keep the items in place. Create a grid is to keep items from shifting out of place. Keep the grid as low-profile as possible. 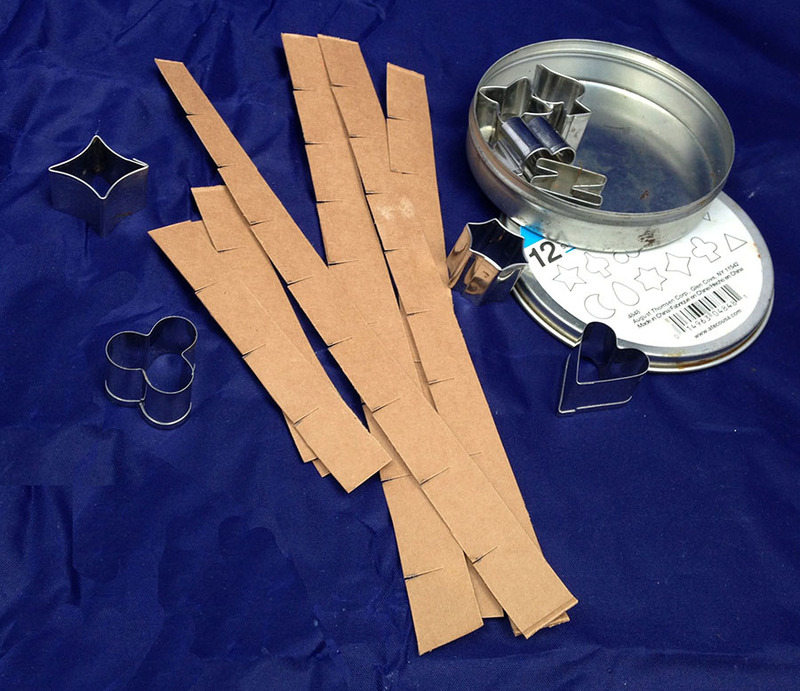 Cut thin strips of cardboard, about 1/2″ thick. Starting 1/2″ from the slide, Slit cardboard strip every 3/4″, just over 1/4″ deep. 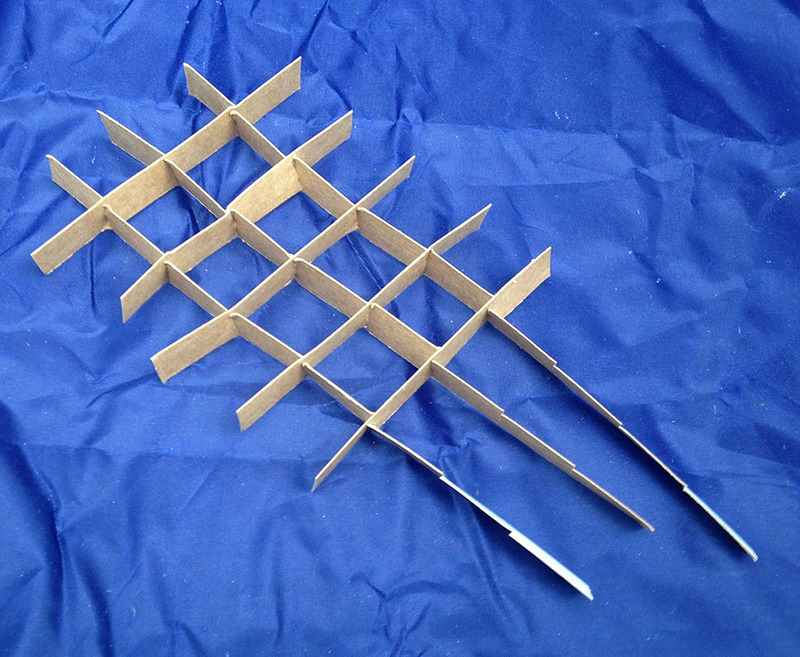 Connect twocardboard strips on their outermost slit, matching slits on both pieces of cardboard you are combining to connect securely. Continue connecting strips to create the grid. The goal of creating the grid is to create something low-profile that will keep items from shifting out of place. For my five year-old, I also cut up scraps of what remained into chunks and included in a second container so he would get enough to eat. 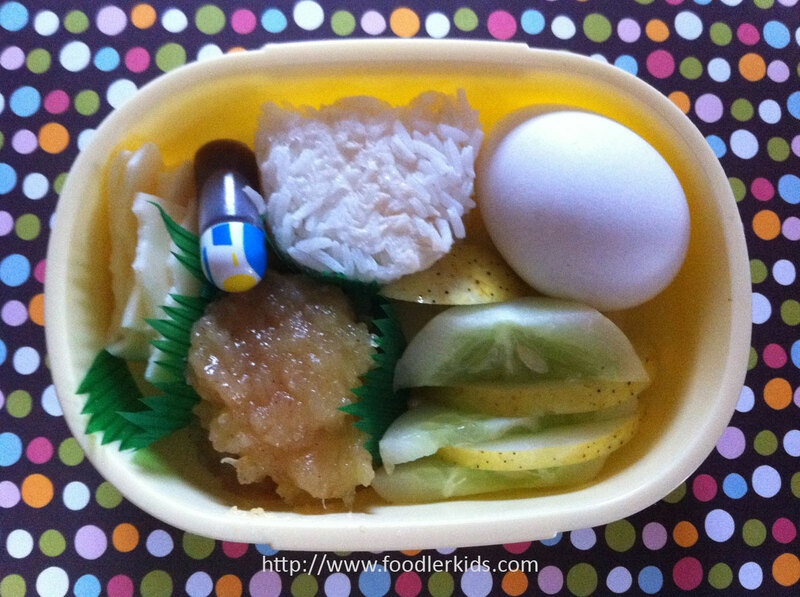 Here’s the second Candy Crush bento lunch (made for my 3 year-old). I snapped a shot of it without a grid, just to see. I think you could easily do the lunch without the support grid, but you’d need to be very precise in cutting shapes a similar size and packing the items tightly. 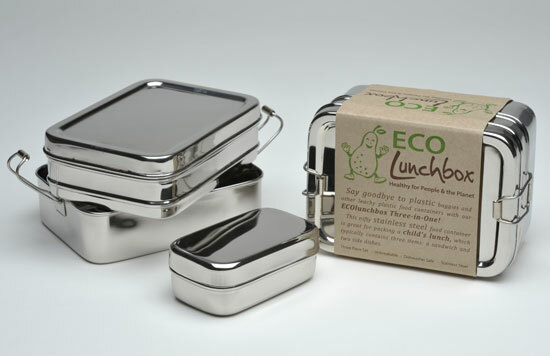 I was very happy the other week to get a text from a friend asking for recommendations for lunch boxes. I haven’t kept up with my blog as much as I’ve liked since I started my own business last October, but it was nice to feel like I can still be a resource. 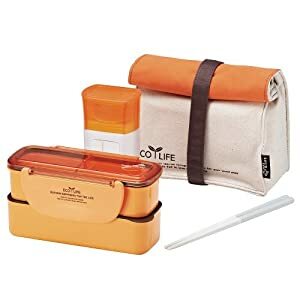 My friend wanted to take the plunge and purchase a reusable lunchbox. It just so happened that I had just ordered a few things on Amazon to round out my supplies and had the perfect recommendation. I have posted before about Lunchbots and am a huge fan. This time, I came across an Ecobots three in one container that seemed like a really good value. Her boys are a bit older than mine, and they can really put food away. That makes this double-decker perfect for them. This box has been super handy packing group snacks for outings to the park. A big change this year is that my youngest child is starting in the toddler program at pre-school. He’s just one-and-a-half, so I needed to find a container that he would be able to work mostly on his own. We piloted the lunchbox today (on our first lunchtime visit), and it went well. The snapping containers are very easy for him to manipulate. The boxes do fit quite snugly in the sack, but I realized that is mostly a concern for me when I am packing the lunch. It will certainly be easier for Peanut to take the container out. Frankly, he can toss it in sideways when he’s done. I just need to make sure it all comes home. The last item I bought was a three-pack of ice-packs. I don’t always use these, because most of the food I pack is OK to sit out for a few hours. I’m lucky with the moderate Bay Area climate. Still, I thought it would be nice to have some on hand. 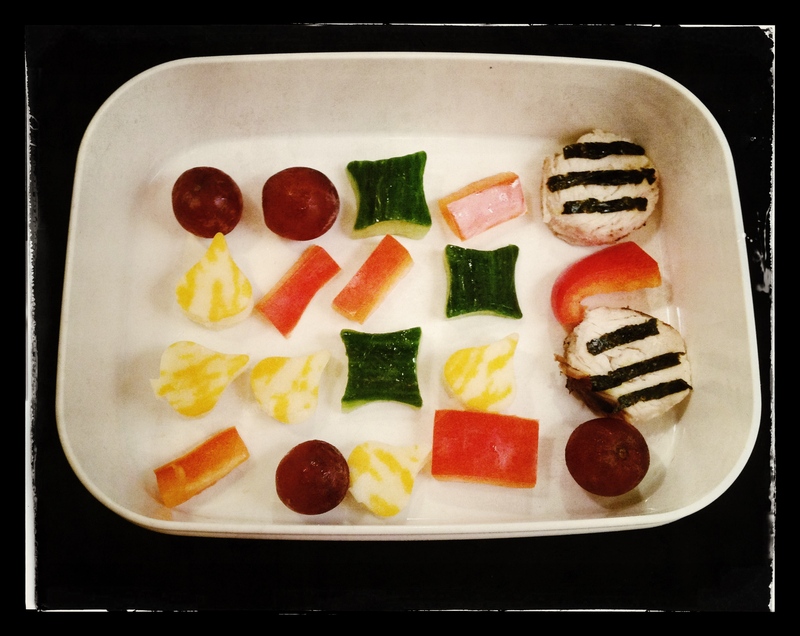 When I first became so interested in bento lunches, I did some reading on the subject early on and was surprised to realize that the reason traditional bentos contain pickled vegetables because these will not spoil easily in hot climates. So clever. Have a great school year! Stay tuned for pictures of my new bento supplies in use. You could not, would not, want to miss a celebration quite like this! All three of my children have birthdays in a five-week span. I wish I had the wherewithal to do separate parties for each of them. I had intended to do something to honor them each individually. But, as the time approached, I realized they older two weren’t going to complain about having a joint party (yet, at ages 5 and 3). Since many of their friends come in a sibling packages, it worked out quite well. I have never used fondant, but I decided I could do it for some key elements if I put my mind to it. I baked two sheet cakes– I made the base using Martha Stewart’s devil’s food cake recipe. My sister-in-law gave me the Martha Stewart cupcake book for Christmas last year. The recipes crazy-delicious and worth the extra effort! I topped the cake with butter cream frosting, which I tinted blue. When I realized I wasn’t going to have enough cake, I used a box of cake mix to make an extra sheet cake, which I needed for decorating. 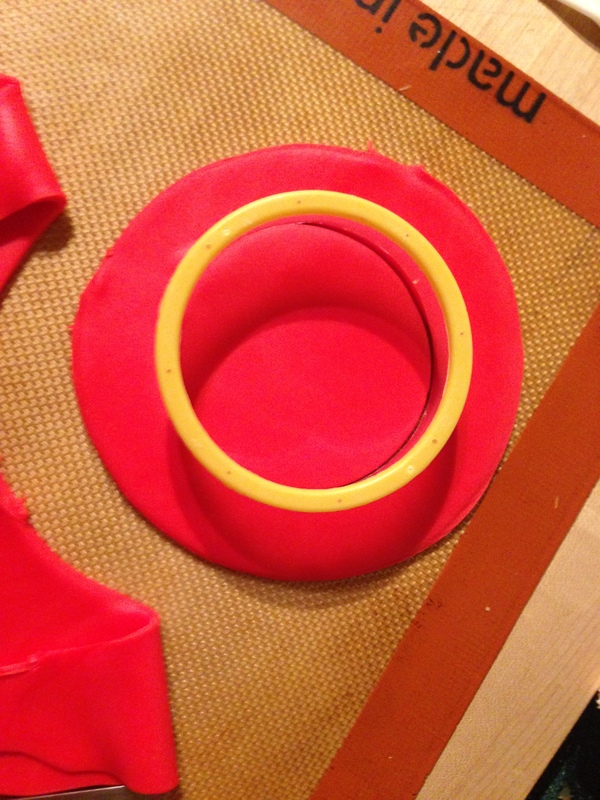 I cut out square pieces and then used a circle cookie cutter to make the layers of the hat. 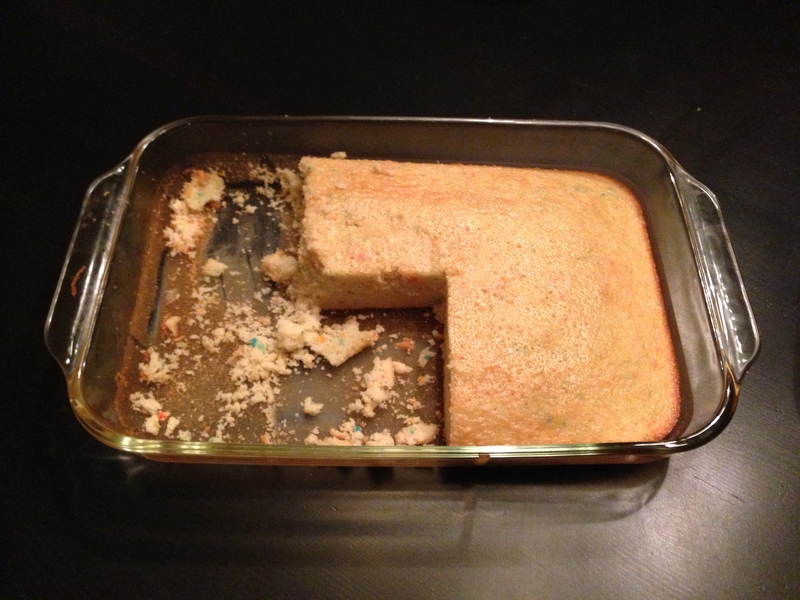 I stuck the layers together with frosting. 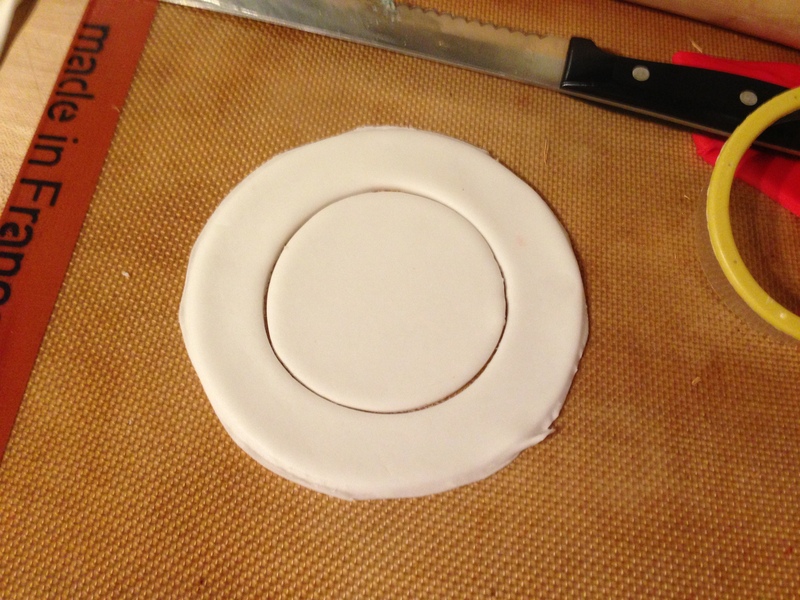 Next I rolled out the fondant, which I bought at Michael’s. (Mine came as a dough, not rolled.) I kneaded red food dye into a section of the fondant and rolled that out, too. 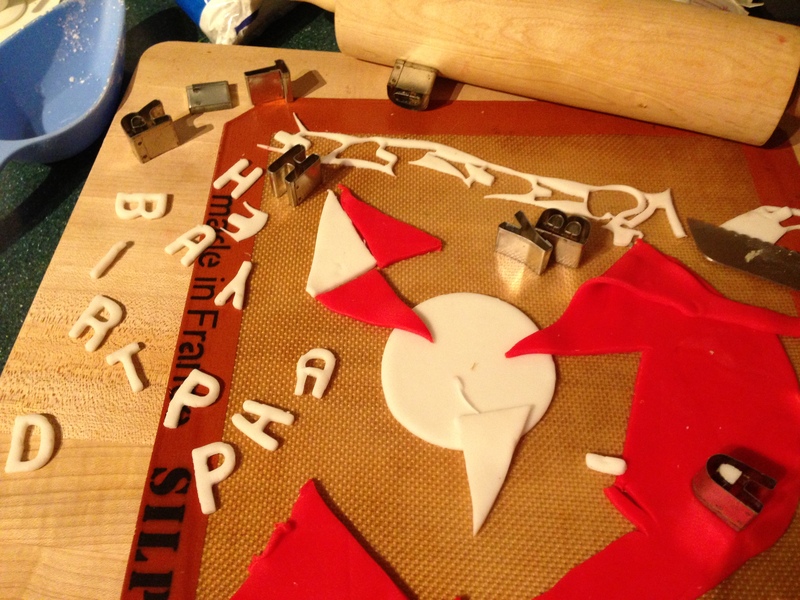 With flat white and red pieces, I made the shapes I needed. 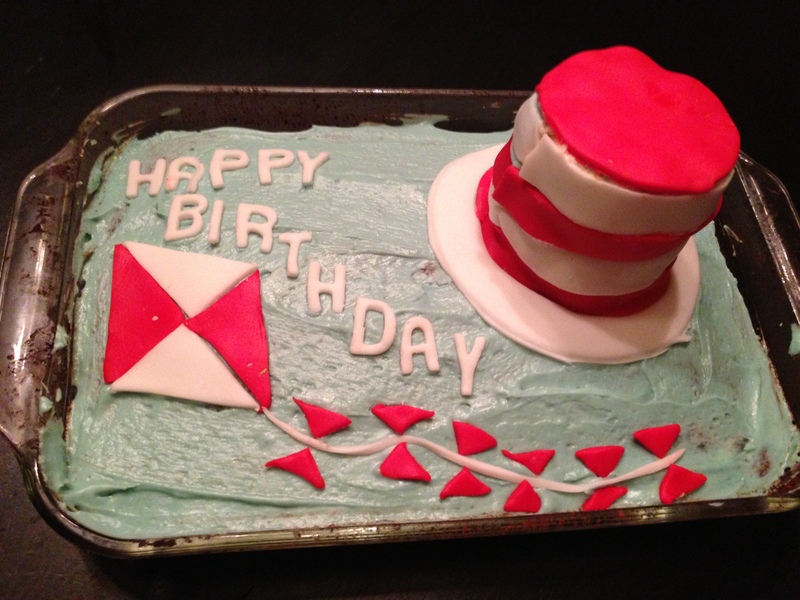 I traced a small plate to form the brim of the hat, and used the same circle cutter I used on the cake pieces for the top of the hat. Notice I originally cut the brim in red, before I realized I needed a white brim. 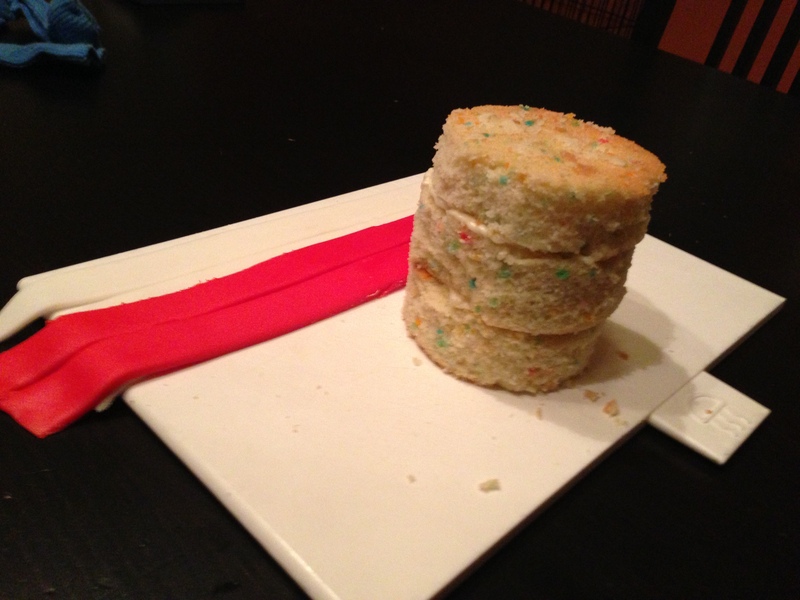 To assemble the cake, I placed the brim I had made in one corner. Next, I frosted the cake base I had made, wrapped alternating strips of red and white around it, then placed it on the cake. I positioned the kites I had made. Finally, I placed the “Happy Birthday” lettering. 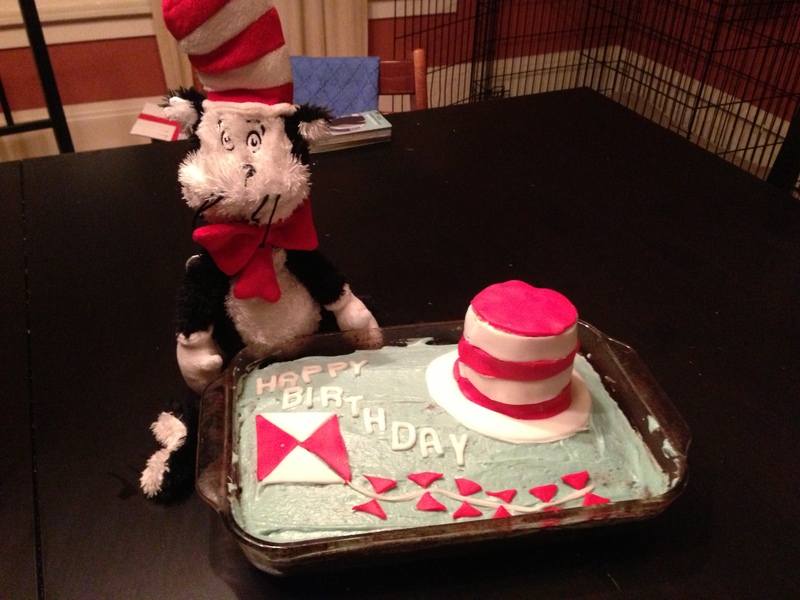 To add to the party theme, we made Cat and the Hat cups, based on ideas found here: http://www.michellesjournalcorner.blogspot.com/2012/02/muffin-tin-monday-dr-seuss-food.html?m=1. Instead of painting them I bought white duck tape and had my kids wrap the red party cups. 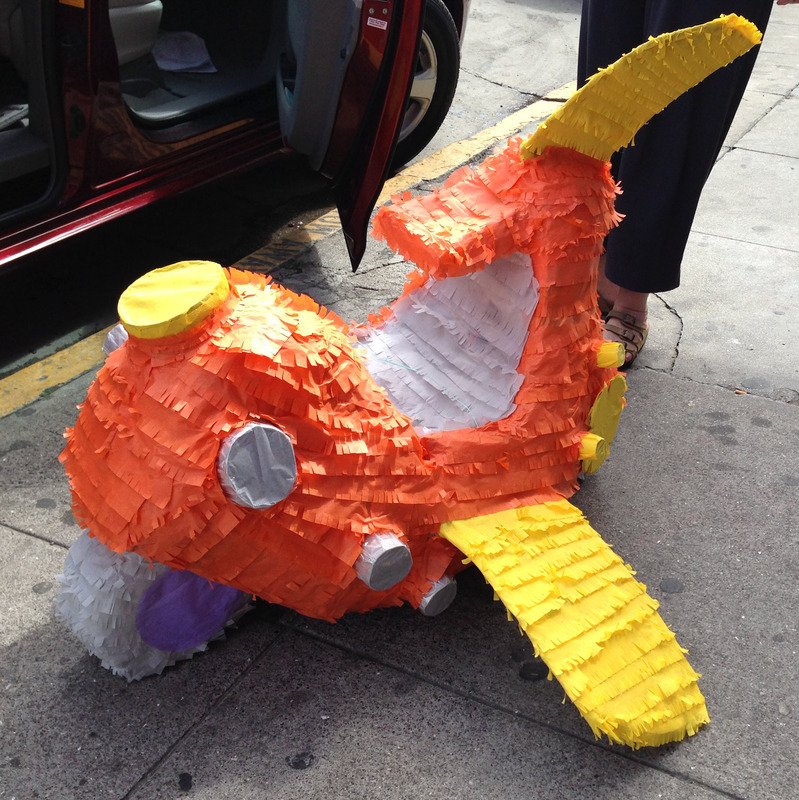 I also splurged on a Thingamajigger piñata. It was HUGE (as in, the size of some of our smaller guests). We are headed to my son’s school tomorrow to celebrate his 5th birthday. There is a proscribed “birthday celebration” at Montessori schools. At our school, this includes the child walking around the sun once for every year of his life. Parents are invited to join the celebration and bring a special treat. We will also share 5 stories about our son with his classmates. 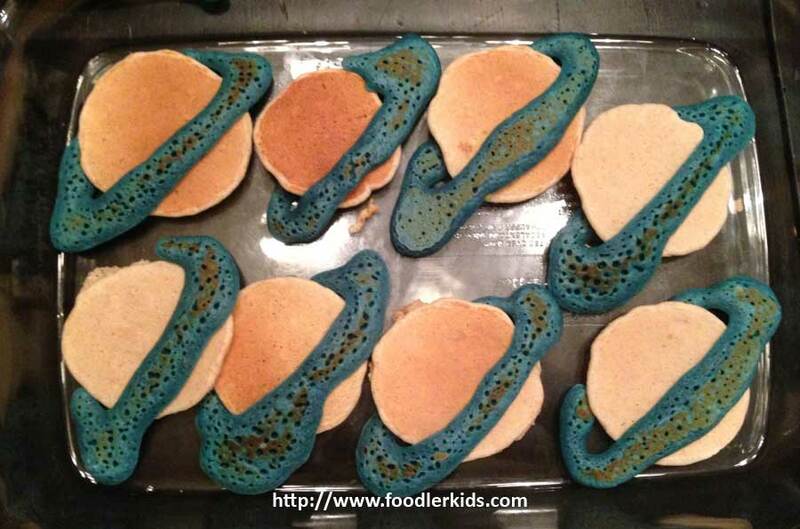 I wanted to tie the snack into the space theme, so I decided to make planet pancakes. Sunflower butter and jelly sandwich, nori, cheese “web”, plums, red pepper, and carrots. Apple coated with sunflower butter and crushed yogurt pretzels, cheese “candy corns”, tofu and red pepper swirls, cheese twists, and pastrami roll. 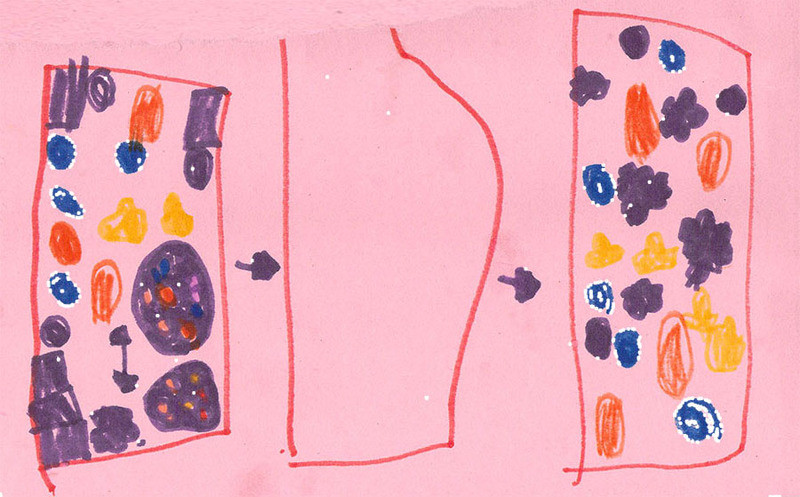 Unfortunately, my son did not follow my logic. So, when I included cucumber lemon in a simple lunch, it came home uneaten. Rice, egg, cucumber, applesauce, and cheese. 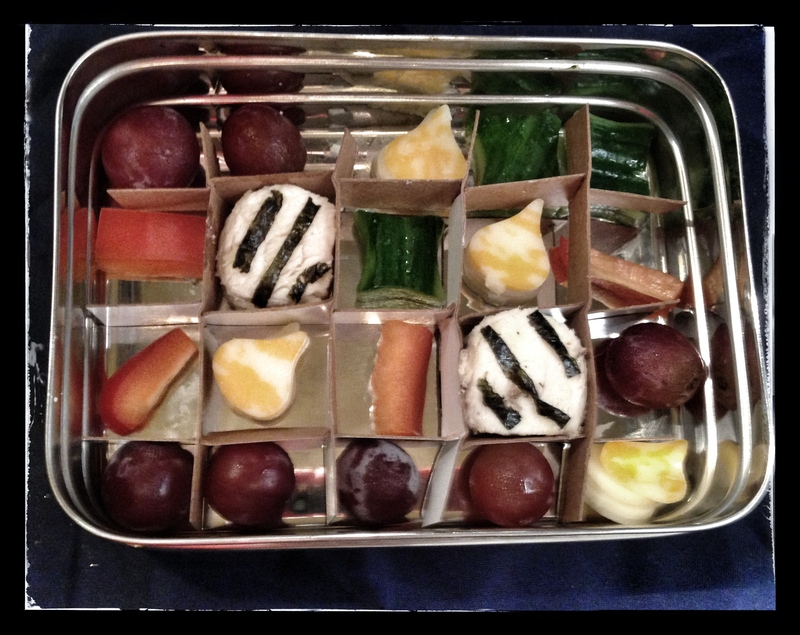 Believe it or not, this bento was the pre-cursor to my Goldilocks bento. I got excited and made the rice and hard-boiled egg without realizing I didn’t have the right ingredients to finish the rest. This turned out to be a plainer, but still tasty and healthy lunch for my guy. 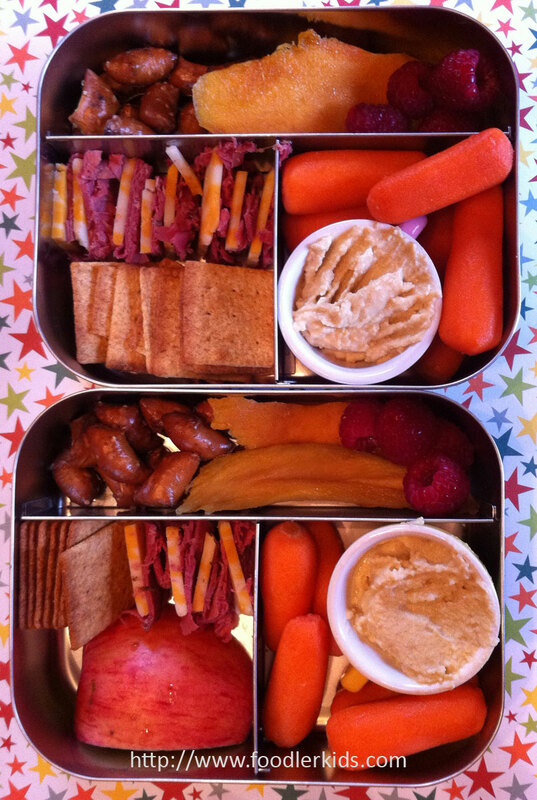 Later in the the week I sent a simpler snack-for-lunch bento for both boys. I used tea cups from their play set for the hummus. 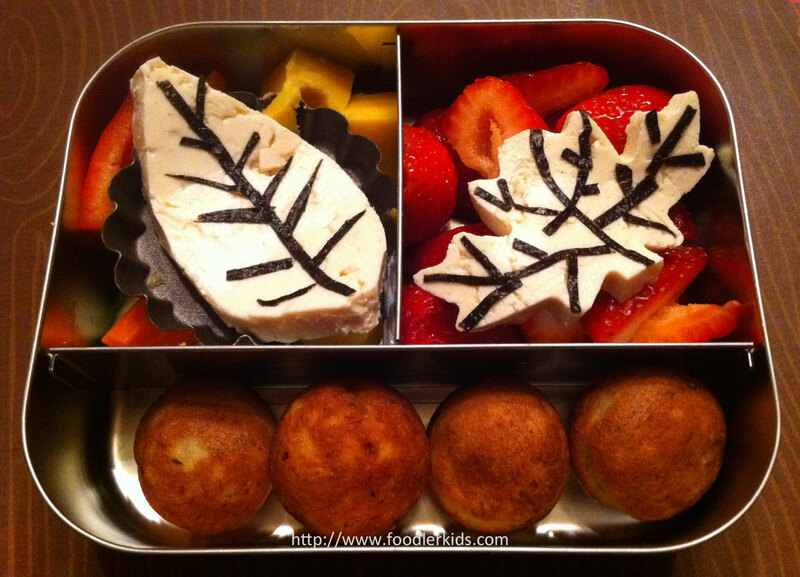 I’ve been whipping up several Halloween-themed bentos, which I’m saving for a separate post. Stay-tuned! Hungry for more? If you like this post, come find Foodler on Facebook or Pinterest. 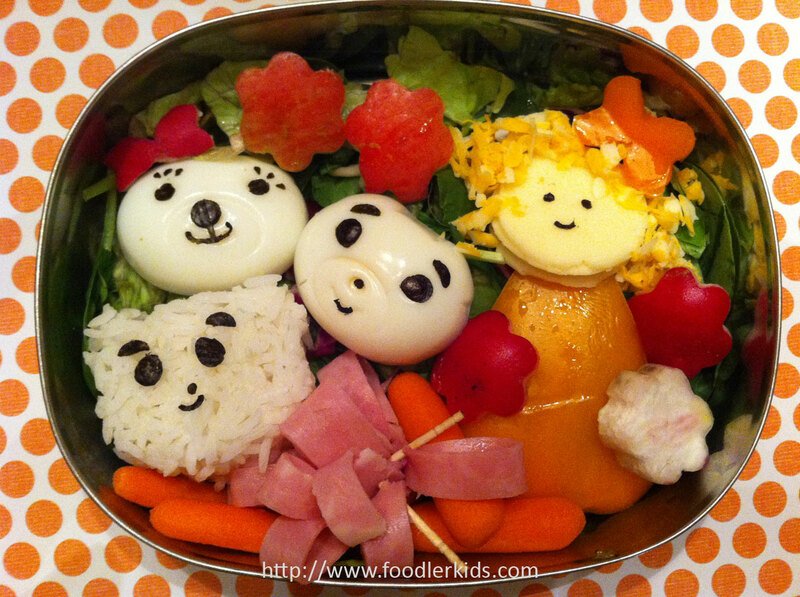 Goldilocks and the Three Bears Bento: rice and egg shaped with bear molds; Goldilocks made from orange pepper, cheese face, and shredded cheese curls. The faces are decorate with nori. This lunch has been in the works for a while. Over the summer a friend emailed and mentioned she was shredding cheese and thought it would work well as hair in some way. It took me quite a while to work out that I could use the rice and egg molds. (I used one egg and cut it in half.) I had a bear cookie cutter that was huge and I just couldn’t get past how that wasn’t going to work. 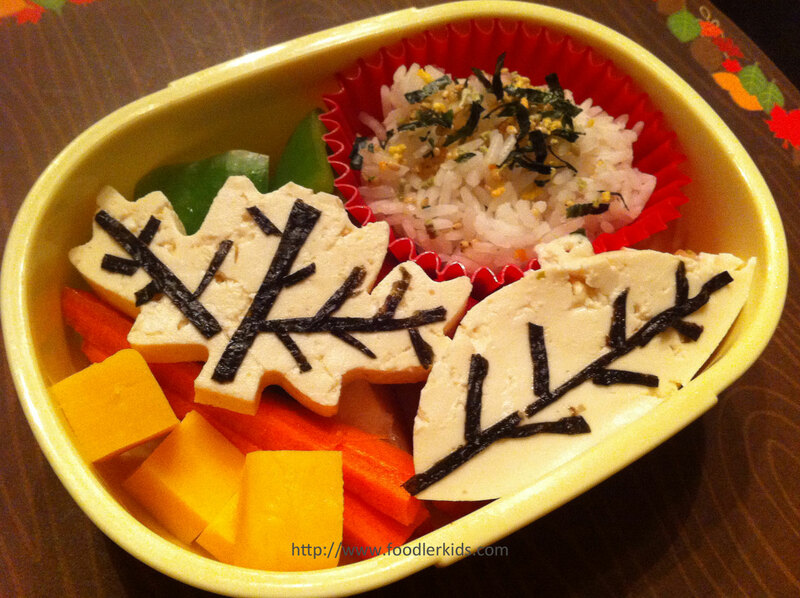 I rounded out the bento with greens, a ham flower, carrots, radish and apple flowers, and pepper and radish hair bows. Fall is one of my favorite time of year. First comes Halloween, then Thanksgiving, then Christmas. It just keeps getting better. I’d been feeling like I was in a bit of rut with lunches lately, and this change of season has been just the thing to kick me into high gear again. 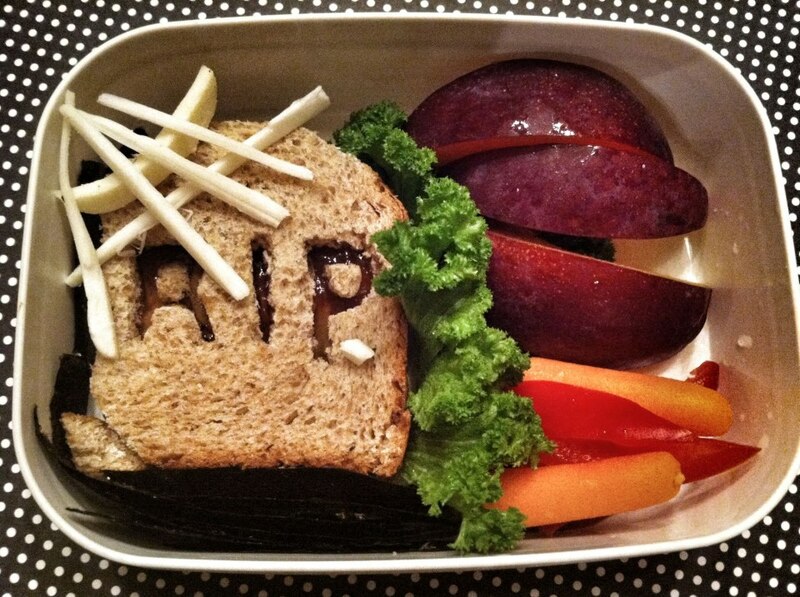 I’m also starting to work on some Halloween-themed lunches. Monday’s lunch was a breeze. Our good friends and neighbors hosted a birthday party for their toddler over the weekend, and of course there were leftovers. This lunch was super-yummy, super colorful, and super-healthy– times two! 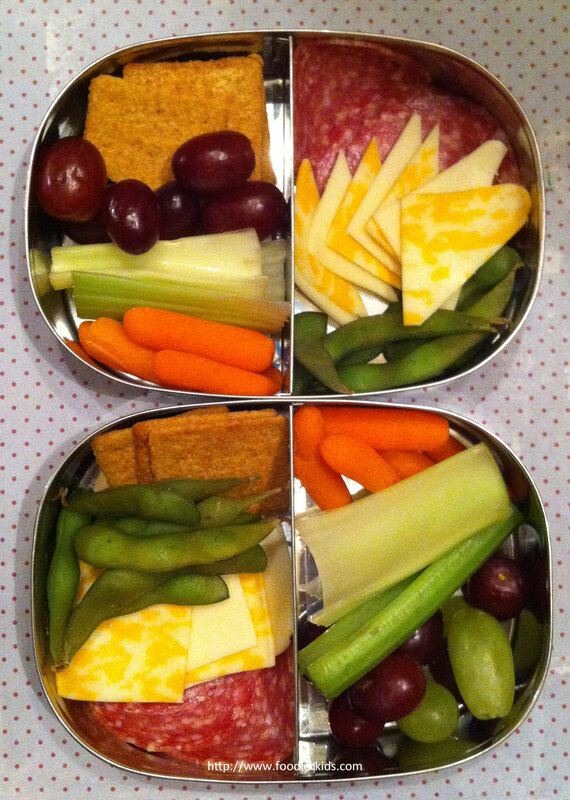 Salami, cheese, edamame, carrot sticks, celery, grapes, and crackers.